We novelists have no idea what we’re doing, he said. Going on to echo Richard Flanagan’s similar thoughts, Miller said readers are the ones who tell you what you’ve done. He recently visited a women’s prison, where he spoke to a group of women – many inside for hardened crimes – who had formed a book club. He went to speak about Coal Creek. Many had read several (or all) of his novels, and one women said she had noted a powerful recurring theme in his work: the influence of the absent mother. 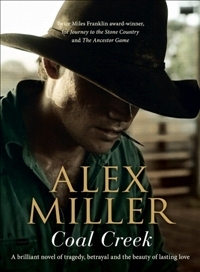 Miller acknowledged that while this absence is true in the life of Bobby Blue, the hero of Coal Creek, Miller had no idea it was something his other novels had also addressed. He went on to tell them about his earliest memory, of being 18 months old and whisked off to a children’s home in a taxi because his mum was about to give birth to his sister. His father was working so there was no one to look after Alex. He was in the home for one week or so, and it had obviously had a much larger impact on him that he could have imagined possible. As he told the women this recollection he realised he was speaking with a group of absent mothers, and it hit him that their children were without their mother, for several years in some cases, and while he had lost his own mum for a week – and to an 18-month old that seemed forever – these mums were in a real sense absent from their children forever. When he left the prison he thought about truth, how you write it. Suddenly it hit him, and he became quite emotional in the car, saying to himself ‘you’ve never thought about liberty, have you?’ It was, he said, time to be afraid of things again, to take on a new challenge. He started in that same moment: by deliberately taking the wrong road home, because ‘sometimes the wrong road is the right f**king road’. It was golden autumn evening, beautiful light falling through the gums that lined this unknown road. It was, he said, exhilarating. Even a dead fox on the road was a thing of beauty. He was enjoying the gift of freedom that these women had given him. He drove on knowing what he had to do, paying the women’s kindness to him forward – or perhaps backwards a little, for he now wants to pay tribute to those who have helped him throughout his life, such as his close friend Max Blatt. Friendship is an important part of his work, as is autobiographical details, but he decided to go in this new direction and highlight it further. Landscape was also highlighted. 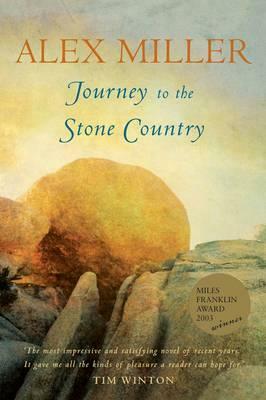 The Stone Country is a place he cannot leave behind, he said. Taking glorious delight in his publishers’ angst, he finally referenced Coal Creek by saying it had taken him all of ten weeks to write, after which it was done. There was no research. It just spilled out of him. During those short weeks he felt as though he was under Bobby’s spell…. just as we, the audience, was under Miller’s during this very funny and moving session.